Every guest wants to see il Colosseo, followed closely by the Vatican Museums, St. Peter’s, Villa Borghese, and many of Rome’s grand and well-known sites. But where do you go once you’ve seen all the most-popular sites? What treasures await those who have more time in Rome? Ric and I have made a point of visiting some lesser-known venues over the past few months and have found some true gems, virtually free of tourists, lacking long lines and crowds. 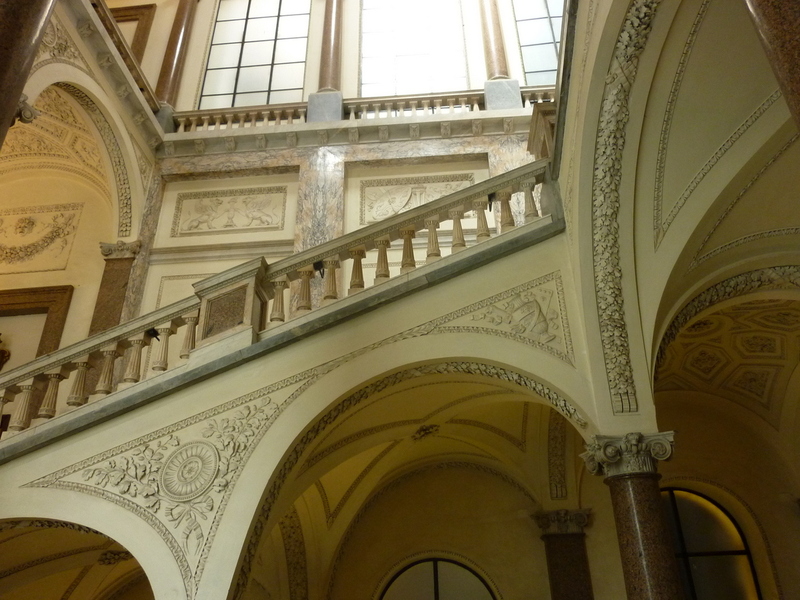 The art is interesting, but Palazzo Braschi is the star. New by Roman standards, Palazzo Braschi dates only to the 18th century. Situated adjacent to Piazza Navona, it is a wonder that so few people venture in. The building itself is amazing, with one of the grandest staircases imaginable. Built with Papal wealth, after financial problems plagued the owner the building was sold to the State. After the Second World War, 300 homeless families lived here causing extensive damage, but restoration work resulted in the fine museum we see today. One hot June day, at the height of tourist season, we found ourselves among a mere handful of people enjoying the cool interior of Palazzo Braschi. The collection features scenes of Rome as painted during the Renaissance. It’s fun to see how things looked to the artists of the time, but the real star is the Palazzo itself. Revel in the architecture and imagine a time when this was a private residence. Palazzo Colonna grandeur: only available on a Saturday. Not every museum is open every day. 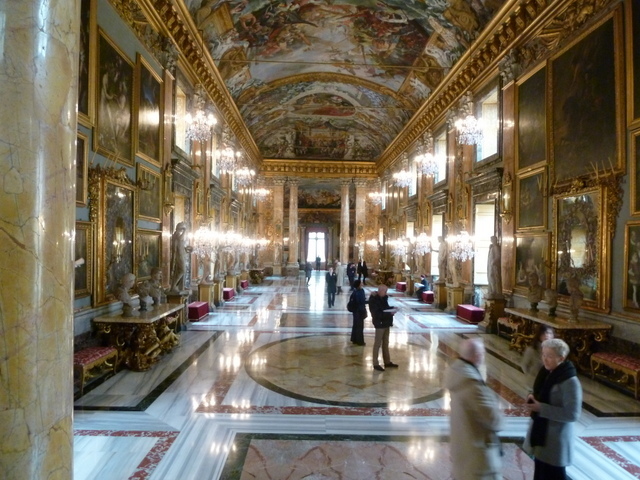 A truly notable exception is the Palazzo/Galleria Colonna. Open only on Saturdays from 09:00-13:15, one has to plan to see this treasure. As a bonus, there is an English tour at 11:45 (Italian at 11:00). Just off Via IV Novembre, Palazzo Colonna presents a less-than-stunning edifice. In fact, we have been past this structure dozens of times without realizing the importance of the site and the art within. (The wax museum at street level provides an odd contrast and is no doubt visited by more people daily than Palazzo Colonna sees in a month… or two.) Once you are inside, it is jaw-droppingly beautiful. If you recall the movie “Roman Holiday” with Audrey Hepburn and Gregory Peck, the final scene of a palace press conference was filmed in Palazzo Colonna. Parts of the palazzo date from the 13th century and there is a claim that “Dante slept here.” Popes and Hapsburgs, feuds and wars, provide background to this enormous and elegant residence and gallery. The family still lives in apartments at the site, explaining perhaps why it is open so few hours each week. 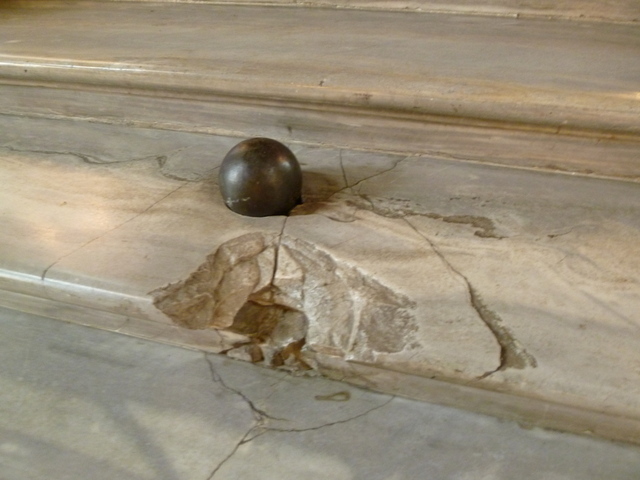 Palazzo Colonna: You’ll have to take the tour to hear the story of the cannon ball…. A formidable façade reveals a grand beauty, seat of the French Embassy. Another one-day-a-week venue – at least for English speakers – is the French Embassy to Italy, located in Palazzo Farnese, which is only open for tours in English on Wednesday, and only at 17:00. (French and Italian language tours are also available on Monday and Friday.) As a working embassy, only portions of the building and grounds are accessible, and one must reserve at least a week in advance; However, for the modest price of €5.00, it is perhaps one of the highest value tours available. 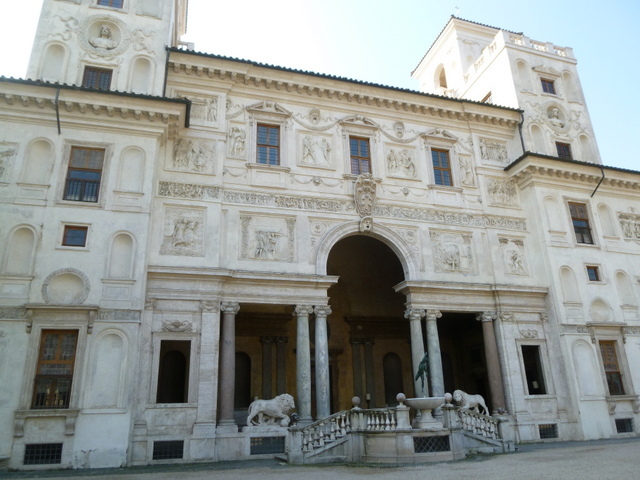 A pope, Michelangelo, Puccini, Annibale Carracci, Queen Christina of Sweden (the proverbial tenant from Hell), and Giacomo della Porta all played a role in the rich history of this palace. 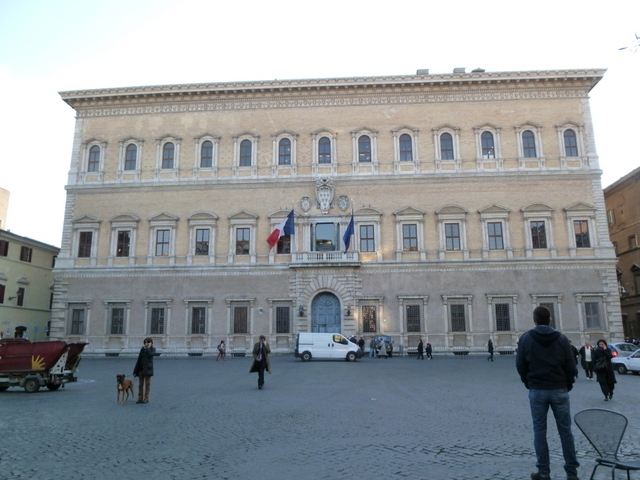 No pictures are allowed inside, but trust me; the severe exterior on Piazza Farnese does no favors to the beauty within. La Casina delle Civette, a curious mix of styles. This is a truly off-the-beaten-path location even for many Romans, Villa Torlonia is a vast and beautiful park with three diverse villas now serving as museums. Once owned by the Pamphilj family (Villa Pamphilj and Galleria Doria Pamphilj are also properties of this enormously wealthy dynasty), it passed to the Colonna family and finally the Torlonia. The estate was extensively remodeled in the early 19th century. There are winding paths, small lakes and fountains, obelisks, the three museums, and more restoration work in progress. Mussolini lived in the Casino Nobile for 18 years, renting it for one Lira per year. You will see families enjoying the grounds, playing, walking, and soaking up the sun from a bench. 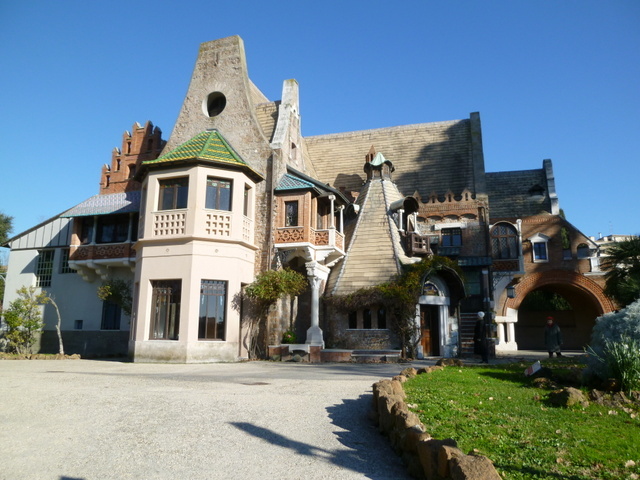 My favorite building is the Casina delle Civette, House of the Owls. Formerly known as “The Swiss Cabin” and originally a refuge from the grand villa Casino Nobile, it has been transformed through the years with a mixture of architectural styles that almost defy description. Go for the stained glass and enjoy the inlaid wood, medieval influences, mosaics and majolica. Villa Medici from the garden. Niobe suffers from hubris and loses al of her children. thoughtlessly with many coats of lime, now again visible thanks to one of the artist-in-residence fellows. 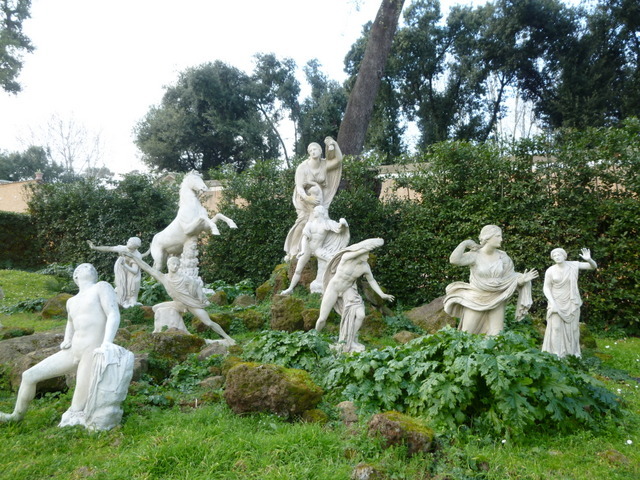 And in one of the 16 squares of the garden, we discover the dramatic installation of Niobe and her dying children. The entire estate was restored in the 20th century, ensuring many generations can continue to enjoy this oasis in the midst of busy Rome. By all means one should see the Colosseum, Forum, Palatine Hill, Borghese Gallery, the Vatican and St. Peter’s. When you’ve seen these historic “must do” sites, when you’ve seen the Caravaggios and the Michelangelos in the magnificent churches, there’s still more to discover in Rome: places where you might just find yourself alone with the art. I have to respectfully disagree with Nancy. Your writing leaves that of most travel editors in the dust! Once again such a nice compliment from you on my writing! That means alot since you are a professional! Now if only someone would pay me to write. Or pay for my trips. i LOVE, LOVE LOVE your little gems! can’t wait to visit them in person!! Grazie, Sharon. Happy to show you around when you come! Amazing!! The fun never stops in Rome!! Miss you guys!! Glad to see you are having a blast!! Well the fun does stop for laundry and grocery shopping…and WORK! Ciao to you and Wally. Miss you too. Come back soon! I have missed your updates….You write like a travel editor….I sit with coffee and visualize all your well reported spots….Thank you for the travels! Great! Glad you like it George! Thanks Anita! I know you love the pictures. I have a few more newsy posts planned, and a trip coming up. Stay tuned! Marvelous “tour” my friend – I truly appreciate you taking the time to write such a wonderful detailed travel blog as you continue your lovely Italian adventure. You are most welcome, dear! Sicily coming up in March!